Jerry’s Mobile Truck Repair is a Southern New Jersey mobile truck repair service. Our mechanics can be dispatched to NJ, PA, DE, MD at a moments notice, 24 hours a day, 7 days per week. 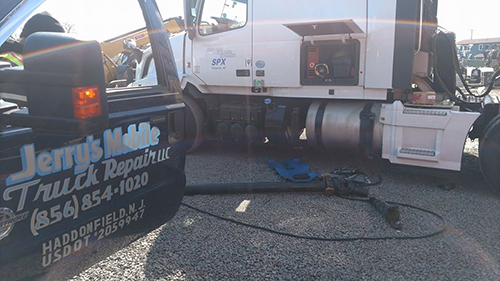 Here at Jerry’s Mobile Truck Repair our mission is to provide you with exceptional service to keep your heavy equipment running smoothly, 24/7. Having been in business for over 30 years, we understand that if your equipment doesn’t work, neither do you; that downtime is costly. With our expanding fleet of well-equipped service vehicles and experienced, professional mechanics we strive to provide a quick response with top notch service, at reasonable rates. Each one of our service vehicles is equipped with a welder/generator, compressor, computer diagnostics, auxiliary fuel cell, and all of the necessary tools to enable us to bring the shop to you. Avoid the long waits at the dealer and expensive tow fees, and let us go the extra mile and come to you; we’ll get you going!